Just add hot water. Helps lower cholesterol.33% Bigger Serving** **Compared to standard 45g pot Helps lower Cholesterol? ?Oat beta-glucan has been shown to lower blood cholesterol. High cholesterol is a risk factor in the development of coronary heart disease. Good Morning! 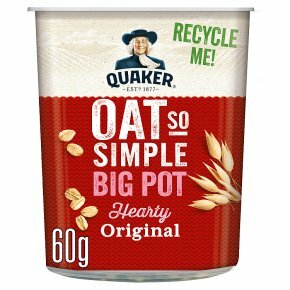 Only 2 mins to perfect porridge 1. Gently mix dry ingredients with a spoon 2. Add boiling water up to the line on the inside of the pot (230ml) 3. Stir thoroughly straight away, and continue to stir for about 15-30 seconds 4. Place lid back on pot and leave to stand for a further minute 5. Stir again, and enjoy Product not suitable for microwaving Product may be hot to hold.